The strong relationship with metabolic syndrome. Early diagnosis and management of NAFLD is thus of vital importance. Dietary modification and exercise constitute the mainstay of treatment. As the link to noncommunicable diseases is clear, there is a need to address this as a public health problem. NAFLD rates are increasing in developing countries as well. Most of the studies examining the natural history of NAFLD in India and worldwide have been conducted in hospital settings with a small sample size and hence, the generalizability is questionable. There is limited information regarding prevalence of NAFLD from India (including rural India). Thus, the objectives of the present study were to estimate the prevalence of NAFLD in adults in a rural community of India, and to measure the association of diet, physical activity, and other selected risk factors with NAFLD. The present study was a community-based cross-sectional study conducted in the villages under the intensive field practice area of the Comprehensive Rural Health Services Project (CRHSP), Ballabgarh. Ballabgarh is situated 35 km southeast of New Delhi in the state of Haryana, India. A total of 28 villages are covered under its field practice area. The study was conducted between October 2009 and March 2011. All individuals aged ≥35 years residing in the study area for at least 6 months were included in the study. Individuals taking ≥20 g/day or ≥140 g/week of alcohol for > 1 year, and seropositive for hepatitis B or hepatitis C (i.e., the presence of surface antigen of the hepatitis B virus or the presence of antibodies versus hepatitis C virus.) were excluded. Based on a community-based study (by Mohan et al. in South India), taking the prevalence to be 32% and absolute precision to be 10%, the sample size was calculated to be 87. Using a design effect of two, the sample size was 174. Considering a refusal rate of 20%, the final sample size was calculated to be 210. This was planned to be achieved by recruiting 27 individuals from each of the eight villages (selected out of a total of 28 villages by using probability proportional to size sampling technique). For this, the population ≥35 years of age were obtained from the Health Management Information System (HMIS) of CRHSP, Ballabgarh, Haryana, India. Selection of 27 households was done by systematic random sampling. Within a household, the inclusion and exclusion criteria were applied to all persons ≥35 years of age available at the time of visit. Within a household, out of the respondents eligible and available at the house at the time of visit, one person was chosen randomly. If no eligible participant was found or the house was found to be locked, the house having the next higher number nearest to the locked house number was selected. This process was followed in the same manner till 27 respondents were recruited. Informed written consent was taken from the participants prior to administration of the study instrument. The study was approved by the Ethics Subcommittee of AIIMS, New Delhi, India. On the first visit, information was collected by a face-to-face interview using a questionnaire (modified suitably after pretesting). The participants were asked to come to the primary health center (PHC)/subcenter on a specified date after an overnight fast (12 h) where physical examination, ultrasonography (USG), and blood sample collection were performed. Physical examination included measurements of body height, weight, blood pressure, waist circumference, and waist to hip ratio. For height and weight measurement, standard methods were followed. Body mass index (BMI) was calculated using the formula weight (kg)/height (m) 2 . The midpoint between the lowest rib and the iliac crest was taken as waist circumference. Hip circumference was recorded at the widest point of the hips using a non-elastic measuring tape (Seca, United Kingdom). Two measurements were made and the mean was taken. The waist-hip ratio for each participant was calculated. Blood pressure was measured in a sitting position in the right arm using mercury sphygmomanometer (Pagoda, Elite Surgical Industries, New Delhi). If the difference between two readings was 10 mmHg or more, a third reading was taken. The reading having a lower value of the two was taken as blood pressure and was recorded to the nearest two mercury sphygmomanometer (Pagoda, Elite Surgical Industries, New Delhi). Five mL of venous blood was collected from each participant taking universal precautions. It was then rapidly transported to the laboratory at CRHSP, Ballabgarh, Haryana, India within 30 min of collection after entering identifying details on the vials. Biochemical analysis for fasting blood glucose, total cholesterol, serum triglyceride, high-density lipoprotein (HDL) cholesterol, aspartate aminotransferase (SGOT), alanine aminotransferase (SGPT), serum alkaline phosphatase (ALP), and serum total bilirubin were performed using ECHO automatic analyzer, Firmware version 3.13 (Embiel Ltd., Dangjeong-dong, Gunpo-si, Gyeonggi-do, South Korea). Commercially available enzymatic kits (made by Transasia Bio-Medicals Ltd. and ERBA Diagnostics, Mannheim, Baden-Württemberg, Germany) were used for the estimation of glucose, cholesterol, HDL cholesterol, and bilirubin. Test for hepatitis B and hepatitis C was performed in all the cases of fatty liver diagnosed by USG. Hepatitis B was tested using hepatitis B surface antigen (HBsAg) testing kit made by Diagnostic Enterprises (Hepacard). Hepatitis C was tested using anti-hepatitis C virus (HCV) testing kit (Instachk, InTec Products, Inc., P.R.C.). During the actual study, USG was performed on all participants using a portable ultrasound machine (MicroMaxx, SonoSite Inc., Washington, United States). The operational definition used for NAFLD in the present study was: "Any degree of fatty liver in the absence of alcohol intake ≥20 g/day or ≥140 g/week and not having hepatitis B or C on serology." As a means of maintaining quality assurance, ultrasonographic findings of 11 participants were cross-checked on the spot by SS. Four out of 11 participants had NAFLD and 100% agreement in diagnosis was there between MA and SS. All the images were saved and photographed. All images of fatty liver-positive cases and 10% of negative cases (randomly selected) were reviewed by SS (blinded for the findings) later. 100% agreement was there in the positive cases of NAFLD. One out of 12 negative cases was found to be a case of mild fatty liver by SS. Test reports were distributed through health workers in sealed envelopes. All participants were given health education. Participants diagnosed to have fatty liver, diabetes, or hyperlipidemia were counseled regarding diet, physical activity, and other necessary lifestyle changes. Participants were referred to CRHSP, Ballabgarh Hospital (secondary care level hospital) when required. Data were entered in Microsoft Excel 2007 and analysis was performed using Statistical Package for Social Sciences version 17.0 (SPSS Inc., Chicago). 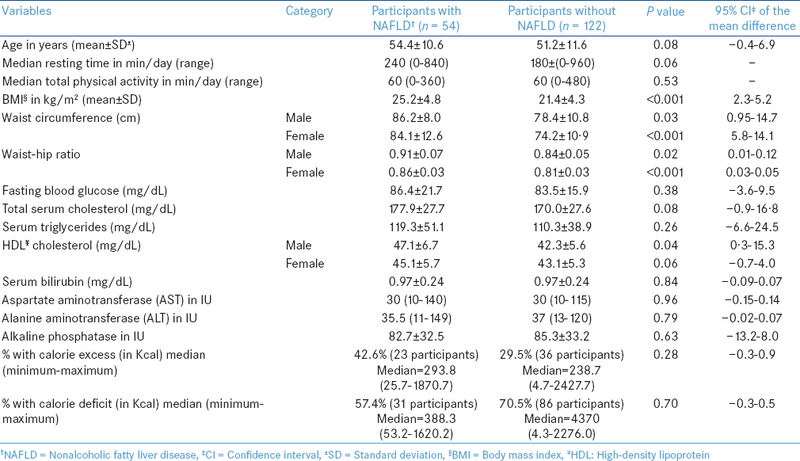 Proportions and means were calculated, along with 95% confidence interval (CI) and standard deviation (SD), respectively. Student's t-test was used to compare continuous variables and chi-square test was used to compare proportions among groups. P value <0·05 was considered to be significant. Due to skewed distribution, variables such as calorie excess, average total physical activity, SGOT levels, SGPT levels, and resting time were transformed to natural logarithms. All of the above variables followed a normal distribution after log transformation. Bivariate analysis was performed using chi-square test (Fischer's exact test wherever applicable). For bivariate analysis, BMI,  hypertension status,  diabetes status,  lipid profile status,  waist circumference  and waist-hip ratio  were categorized according to standard guidelines. Multivariate analysis was performed using logistic regression to identify various risk factors (independent variables) of NAFLD (dependent variable). Variables, which were significantly associated (P < 0.25) in bivariate analysis were included in the multivariate analysis. As values for waist circumference and waist-hip ratio would be highly correlated (the latter is calculated from the former), only waist circumference was included in the regression equation. Adjusted odds ratio (OR) was calculated to measure the independent effect of the risk factors. [Figure 1] shows the flow of participants. The most common reason for refusal to participate was poor experience in the past of not getting reports after being tested in some of the projects (nine participants out of 24). Other reasons were perceived belief of having no disease, traveling to some other place, etc. During the study, 33 houses were found to be locked or with no one present during the visit. The number of houses with at least one member present at the time of visit but having no eligible participants was 14. 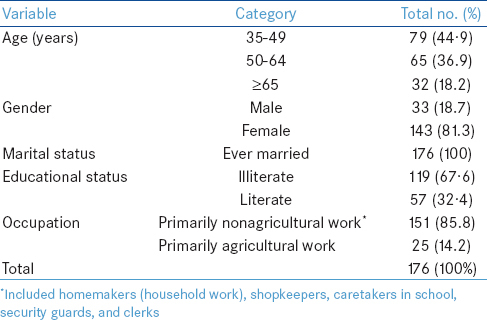 [Table 1] shows the sociodemographic characteristics of the study participants. Most of the population studied was young to middle-aged, females, married, and illiterate. Though 85.8% of the participants did primarily nonagricultural work, most of them were also involved in some form of agricultural work, either helping their family members or working as part-time laborers. The study participants' illness profile reflected that 26.7% had hypertension (previously and newly diagnosed), 7.4% had diabetes mellitus (previously and newly diagnosed), 1.7% had cerebrovascular disease, 1.1% had coronary artery disease, and 4.5% had liver/gallbladder disease. Only participants having documentation of previous history of these abovementioned diseases were counted. 35.8% of participants were ever smokers, 9.1% were ever users of alcohol (less than the exclusion criteria). 54.5% participants had undergone at least one surgery in their lifetime. Most of these were family planning operation (tubal ligation) while others were hysterectomy, cholecystectomy, etc. 14.2% used the prescribed drugs continuously for the last 6 months for various health conditions. The overall prevalence of NAFLD was 30.7%. Eleven out of 33 males (33.3%) had NAFLD and 43 out of 143 females (30.1%) had NAFLD. When only USG-diagnosed fatty liver was considered, 74.1% cases had mild fatty liver, 22.2% had moderate fatty liver, and only two out of 176 cases had severe fatty liver. [Table 2] compares participants with NAFLD and without NAFLD. [Table 3] shows the effects of demographic, nutritional, and physical activity-related indicators on NAFLD. High SGOT (≥25 IU) values were present in around 72% of USG-diagnosed NAFLD cases and non-NAFLD cases. Similarly, high SGPT (≥25 IU) values were present in 83.3% of NAFLD cases and 82% of non-NAFLD cases. [Table 4] shows the effects of various physical and biochemical parameters on NAFLD. On multivariate analysis, hypertension (adjusted OR: 2.3, 95% CI: 1.1-5.0, P 0.03) and an increased waist circumference (adjusted OR: 4.9, 95% CI: 1.5-7.0, P < 0.001) were independently associated with NAFLD. A normal HDL level was protective against NAFLD (adjusted OR: 0.4, 95% CI: 0.2-0.8, P 0.001). NAFLD was significantly associated with hypertension (adjusted OR: 2.3, 95% CI: 1.1-5.0, P 0.03). Hypertension was also reported to be associated with NAFLD in other studies. ,,,, High serum cholesterol level was not an independent risk factor in the present study though was a recognized risk factor in previous studies. ,, Risk for NAFLD was significantly higher among participants who had a higher waist circumference (adjusted OR: 4.9, 95% CI: 1.5-7.0, P < 0.001). This was similar to the previous literature where significant associations of NAFLD with this parameter have been proved. ,,,,, A normal HDL cholesterol was found to be protective against NAFLD, similar to many studies conducted earlier. In a previously conducted case-control study, the total calorie intake of NAFLD cases was significantly higher than the controls. In our study, excess calorie intake and low physical activity were not significantly associated with NAFLD though the resting time was higher in participants with NAFLD than those without NAFLD. The present study was a community-based study. Only three out of previous five studies on prevalence from India, i.e., by Mohan et al.,  Amarapurkar et al.,  and Das et al. were community-based. A single-trained investigator, a physician conducted the study with good quality control checks. One limitation of the present study was that we selected a person above 35 years of age who was "available" during the house visit at daytime. In rural Haryana, which is agriculturally advanced, most males are involved in agriculture even though they have a different primary occupation. They leave very early in the morning and return late to their houses. Thus, during the study, most of the males could not be contacted further, in spite of efforts made to do so. Another reason was that because of the eligibility criteria for alcohol intake, 22 persons got excluded from the study, all of which were males. In spite of this, we think the results are fairly generalizable. This is because when males and females were analyzed separately for risk factors for NAFLD, there was not much of a difference between the two. For example, the mean age of males and females was 54.6 years (SD 11.7) and 51.7 years (SD 11.3), respectively. Similarly, the mean BMI for males was 21.8 kg/m 2 , whereas for females it was 22.8 kg/m 2 . Physical activity-wise also, not much difference was there, i.e., 103.7 for males and 91.8 for females. The prevalence of NAFLD (33% in men and 30% in women) was also similar in both genders, which corroborated with previous studies. There could also be a possible underreporting of alcohol intake due to social desirability bias leading to overestimation of results, which means that some cases of NAFLD might actually have been cases of alcoholic fatty liver disease. It can be concluded that the prevalence of NAFLD among adults (35 years and above) living in rural areas of Ballabgarh block, Haryana, India was 30.7%. Out of all these, most cases (74.1%) were of a mild variety, which indicates great scope for early intervention. Known cardiometabolic risk factors such as hypertension and central obesity were found to be independent risk factors for NAFLD. A normal HDL level had a protective effect. There are important implications of the study. There is a need for further research regarding the burden and risk factors of NAFLD in India, especially in rural areas. Abdominal USG should be routinely used as a screening tool in those patients coming to health centers for any type of diagnostic USG, those having one or more components of metabolic syndrome, and in noncommunicable disease clinics. As a lot of patients undergo USG for different reasons, it is important for clinicians who routinely perform USG to take this as an opportunity for early detection of NAFLD. We owe our sincere thanks to Dr. Naval K. Vikram., Additional Professor, Department of Medicine, AIIMS, New Delhi, India, for providing technical guidance and encouragement for conducting the study. Clark JM, Brancati FL, Diehl AM. The prevalence and etiology of elevated aminotransferase levels in the United States. Am J Gastroenterol 2003;98:960-7. Targher G. Non-alcoholic fatty liver disease, the metabolic syndrome and the risk of cardiovascular disease: The plot thickens. Diabet Med 2007;24:1-6. Frith J, Day CP, Henderson E, Burt AD, Newton JL. Non-alcoholic fatty liver disease in older people. Gerontology 2009;55:607-13. Ali R, Cusi K. New diagnostic and treatment approaches in non-alcoholic fatty liver disease (NAFLD). Ann Med 2009;41:265-78. Dabhi AS, Brahambhatt KJ, Pandya TP, Throat PB, Shah MP. Non-alcoholic fatty liver disease. Journal, Indian Academy of Clinical Medicine 2008;9:36-41. Mohan V, Farooq S, Deepa M, Ravikumar R, Pitchumoni CS. Prevalence of non-alcoholic fatty liver disease in urban South Indians in relation to different grades of glucose intolerance and metabolic syndrome. Diabetes Res Clin Pract 2009;84:84-91. World Health Organization. Report of the Joint FAO/WHO Ad Hoc Expert Committee. Energy and Protein Requirements. 1973. Tech Rep Ser No 522. Available from: http://apps.who.int/iris/bitstream/10665/41042/1/WHO_TRS_522_eng.pdf. [Last accessed on 2014 Jan 18]. World Health Organization. Global Physical Activity Questionnaire (GPAQ) Analysis Guide. Surveillance and Population-Based Prevention. Prevention of Noncommunicable Diseases Department. Geneva: World Health Organization; Available from: http://www.who.int/chp/steps/resources/GPAQ_Analysis_Guide.pdf. [Last accessed on 2009 Aug 25]. Joseph AE, Saverymuttu SH, al-Sam S, Cook MG, Maxwell JD. Comparison of liver histology with ultrasonography in assessing diffuse parenchymal liver disease. Clin Radiol 1991;43:26-31.
International Diabetes Federation. IDF Clinical Guidelines Task Force. Global Guideline for Type 2 Diabetes. Brussels: International Diabetes Federation; 2005. Available from: http://www.idf.org/webdata/docs/IDF%20GGT2D.pdf. [Last accessed on 2013 Jan 05]. U.S. Department of Health and Human Services. Public Health Service. National Institutes of Health. National Heart, Lung, and Blood Institute. Third Report of the National Cholesterol Education Program (NCEP) Expert Panel on Detection, Evaluation, and Treatment of High Blood Cholesterol in Adults (Adult Treatment Panel III). Executive Summary. National Cholesterol Education Program. National Heart, Lung, and Blood Institute. National Institutes of Health. NIH Publication No. 01-3670 May 2001. Available from: http://www.nhlbi.nih.gov/guidelines/cholesterol/atp3xsum.pdf. [Last accessed on 2013 Jan 02]. World Health Organization. Definition, Diagnosis and Classification of Diabetes Mellitus and its Complications. Report of a WHO Consultation. Part 1: Diagnosis and Classification of Diabetes Mellitus. World Health Organization. Department of Noncommunicable Disease Surveillance. Geneva: Available from: http://apps.who.int/iris/bitstream/10665/66040/1/WHO_NCD_NCS_99.2.pdf. [Last accessed on 2013 Jan 02]. Amarapurkar D, Kamani P, Patel N, Gupte P, Kumar P, Agal S, et al. Prevalence of non-alcoholic fatty liver disease: Population based study. Ann Hepatol 2007;6:161-3. Das K, Das K, Mukherjee PS, Ghosh A, Ghosh S, Mridha AR, et al. Nonobese population in a developing country has a high prevalence of nonalcoholic fatty liver and significant liver disease. Hepatology 2010;51:1593-602. Singh SP, Nayak S, Swain M, Rout N, Mallik RN, Agrawal O, et al. 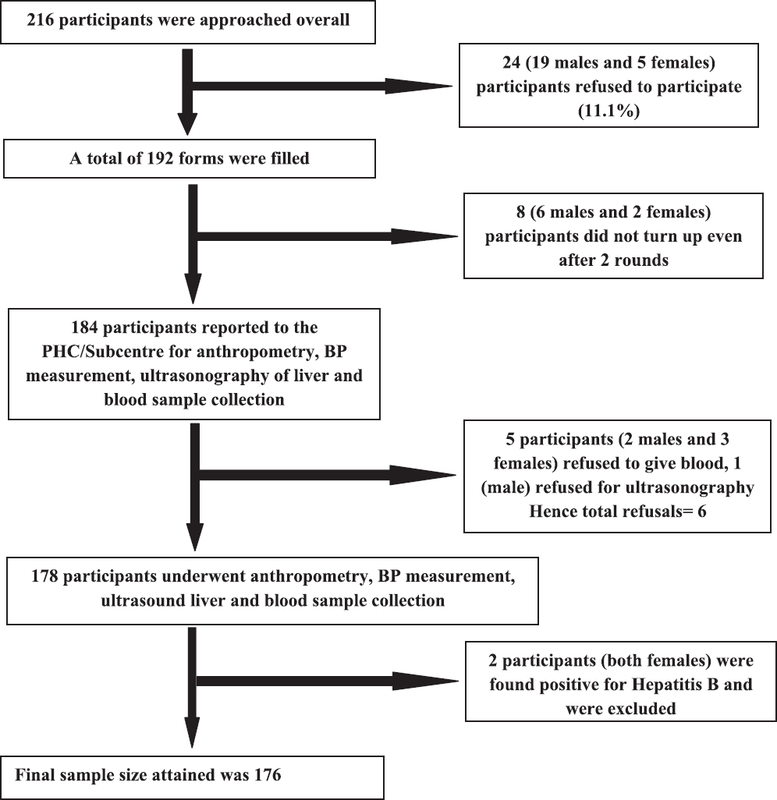 Prevalence of non-alcoholic fatty liver disease in coastal eastern India: A preliminary ultrasonographic survey. Trop Gastroenterol 2004;25:76-9. Bajaj S, Nigam A, Luthra A, Pandey RM, Kondal D, Bhatt SP, et al. A case-control study on insulin resistance, metabolic co-variates & prediction score in non-alcoholic fatty liver disease. Indian J Med Res 2009;129:285-92. Dassanayake AS, Kasturiratne A, Rajindrajith S, Kalubowila U, Chakrawarthi S, De Silva AP, et al. Prevalence and risk factors for non-alcoholic fatty liver disease among adults in an urban Sri Lankan population. J Gastroenterol Hepatol 2009;24:1284-8. Kim HJ, Kim HJ, Lee KE, Kim DJ, Kim SK, Ahn CW, et al. Metabolic significance of nonalcoholic fatty liver disease in nonobese, nondiabetic adults. Arch Intern Med 2004;164:2169-75. Williams CD, Stengel J, Asike MI, Torres DM, Shaw J, Contreras M, et al. Prevalence of non-alcoholic fatty liver disease and nonalcoholic steatohepatitis among a largely middle-aged population utilizing ultrasound and liver biopsy: A prospective study. Gastroenterology 2011;140:124-31. Zelber-Sagi S, Nitzan-Kaluski D, Halpern Z, Oren R. The prevalence of primary non-alcoholic fatty liver disease in a population-based study and its association with biochemical and anthropometric measures. Liver Int 2006;26:856-63. Jimba S, Nakagami T, Takahashi M, Wakamatsu T, Hirota Y, Iwamoto Y, et al. Prevalence of non-alcoholic fatty liver disease and its association with impaired glucose metabolism in Japanese adults. Diabet Med 2005;22:1141-5. Selm SA. Prevalence of non-alcoholic fatty liver disease (NAFLD) and its association with metabolic syndrome in adults people living in Aden. Middle East J Fam Med 2010;8:17-20. Agrawal R, Mishra S, Dixit VK, Rai S. Association of Nonalcoholic fatty liver disease with obesity. Indian J Prev Soc Med 2008;39:13-6. Zhou YZ, Li YY, Nie YQ, Ma JX, Lu LG, Shi SL, et al. Prevalence of fatty liver disease and its risk factors in the population of South China. World J Gastroenterol 2007;13:6419-24. Yoo HJ, Park MS, Lee CH, Yang SJ, Kim TN, Lim KI, et al. Cutoff points of abdominal obesity indices in screening for non-alcoholic fatty liver disease in Asians. Liver Int 2010;30:1189-96. Sathiaraj E, Chutke M, Reddy MY, Pratap N, Rao PN, Reddy DN, et al. A case-control study on nutritional risk factors in non-alcoholic fatty liver disease in Indian population. Eur J Clin Nutr 2011;65:533-7.